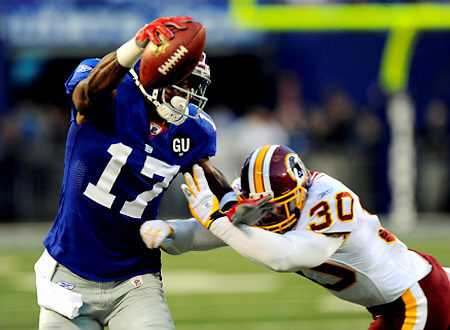 Plaxico Burress has had four seasons in his career with over 1,000 yards receiving. The former Pittsburgh Steelers and New York Giants wide receiver has six years with at least 60 receptions and has reached double digits in touchdown catches twice. At 6-foot-5, he provides a huge target for his new quarterback Mark Sanchez, especially in the red zone, where Sanchez completed only 47.7 percent of his passes last season. Most importantly for his new team, the New York Jets, who have been to back-to-back AFC Championship games, Burress earned a Super Bowl ring with the Giants in 2007. However, even though Burress bring a lot to the table, the Jets may be expecting too much if they feel Burress will be a key contributor this season. Burress has not played football since 2008. Instead, he has spent most of the last two years in prison. Many people point to the Philadelphia Eagles’ Michael Vick as an example of how NFL players can succeed after they finish their time in jail. There are many differences between Vick’s success story and the path Burress wants to take. For one, Vick was 29-years old after signing with the Eagles following his release from prison in 2009. Burress will be 34 when the Jets kick off their season against the Dallas Cowboys on Sunday Night Football on September 11. It also took Vick a full year to adjust to playing football again; he accumulated only 181 total yards and three touchdowns in 12 games with the Eagles in 2009 before totaling 3,694 yards and 30 touchdowns during the 2010 season, also while playing 12 games. If it took Vick a full year to get back up to speed playing in a less physically demanding position (although Vick certainly takes his lumps as a QB), the Jets may be making a mistake in expecting Burress, who is attempting his comeback at a much older age than Vick, to have a big impact at a position where he will need to be physical and take hits to be successful. The Jets’ rationale for signing Plaxico Burress makes sense. He is a proven possession-type receiver who will be a gigantic target for Mark Sanchez in the passing game. The Jets are expecting Plaxico Burress to be their No. 2 receiver behind Santonio Holmes. However, after missing the last two seasons because of jail time, it may take Burress longer than New York would like to re-adjust to the speed and physicality of playing football in the NFL again. The Jets expect Burress to play a key role in what they believe is a Super Bowl contending team. What they get from him may dent those championship aspirations.